Warren is one of Britain’s leading professional free skiers and an Internationally Qualified Performance Coach and Instructor. He has been a sponsored Volkl freeski athlete for over 10 years and has represents brands such as Scott Sport, Swiss Airlines and Dalbello. He has spent many years teaching recreational skiers, developing ski instructors and coaching athletes all over Europe. He is one of the most innovative instructors working in the Alps today and has earned a name for himself for the constant research and development he carries out combining Ski Technique, Ski Biomechanics and Ski Physiology. 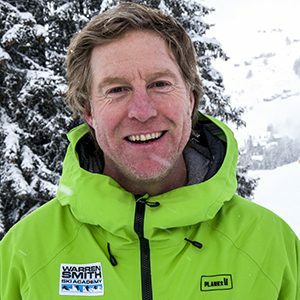 He has written, directed and produced the best selling ski technique DVDs, Ski Academy – Lesson’s 1, 2, 3 + 4 which have sold over 35,000 copies globally to date. In 2007 he finished writing an international book titled ‘Go Ski’ for DK Books. DK are part of the Penguin Books Group and the book was published in several languages including French, German, Italian and Spanish to name but a few. The book has now had over 100,000 copies printed around the world and has given Warren an international reputation in the world of ski coaching.